The connection between print and manuscript. One intriguing question is the extent of overlap between these (often anonymous) newsletters being sent from foreign locales and what ends up getting published in the English newspapers. Before the last decade, this question was of minimal importance since few people had access to the large number of newspapers published in the early 18C. But newspaper databases have now made the question more relevant to scholars. The degree of correspondence between print and manuscript is particularly important since we often assume that archival sources are more ‘reliable’ than contemporary published news accounts. But is it always better to find the archival version? Are newspaper accounts as good as the archival versions, if only because they are more easily accessible, and because they were read by a much broader public than most archival documents? Perhaps newspaper accounts might even have information unavailable in the archives? Inquiring minds want to know. To expand our vision a little further in this regard, we can return to our example of the English report of the capitulation of Stevensweert. Here are a few of the printed accounts of the conclusion of the siege, just to give an idea of the amount of detail available to the English public at the time. This account is almost exactly the same as the newsletter sitting in the archives, which we quoted in the previous post, and far more detailed than the excerpt included in Marlborough’s Letters and Dispatches. The verbatim quotation is only natural: the original newsletter was sent to the Secretary of State, in whose office the Gazette was produced. The London byline, the fact that the account was published in the Daily Courant on the same day as it appeared in the London Gazette, as well as the fact that almost all of the details are exactly the same in both (including the number of men and barrels of powder) all suggest that the original newsletter’s content was shared by the Secretary of State’s office with the publisher of the Courant. A more detailed investigation of the publishers/editors of the paper might elucidate the connections further. A more sustained analysis would be useful in identifying the amount of overlap between the various papers. Note as well that the London Gazette and the Post Man illustrate the mixed terminology used: the Allied camp vs. the Confederate camp. My sense is that the term ‘confederate’ was much more common in the 9YW and ‘Allied’ in the WSS, but I haven’t explored the matter in great detail. In the secondary literature historians almost always use “Allied,” possibly because “Confederate” is so closely linked to the American Civil War? Several other papers (the Flying Post, the English Post) failed to mention the surrender at all, at least that I could find in my quick search, while the Post Boy has only a passing reference in an unrelated news item. But the lack of coverage shouldn’t be too surprising. 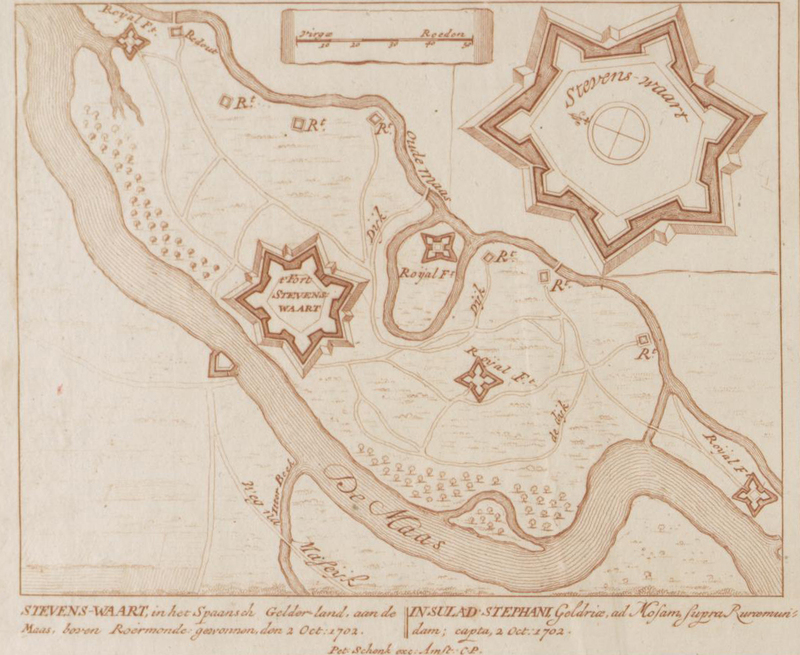 Stevensweert was a relatively minor siege, as is suggested by the frequency with which reporting on the siege was combined with news of the near-contemporary siege of Roermond (Ruremond). The above reports also offer slightly different perspectives: letters from the army camp (themselves reporting news received from the siege camp before the town), and a letter written in London summarizing several accounts from the army camp. There were four English regiments serving at the siege, but apparently none of them wrote accounts back home, or at least not to people who could quickly put them in the papers. “…. The 16th, Lieutenant General Count Noyell, the Right Honourable Earl of Orkenay, Major General; Brigadier Withers, with the Honourable Lieutenant General Stewart’s Regiment, and Collonel Howe’s, were detached to the Siege of Stevenswaert, a small Town, but naturally strong, being surrounded with the River Maese, here very rapid, besides all that, such Scituation might make requisite, Art fully supply’d. The 18th our Batteries Play’d, and on the 20th it Surrender’d. The Garrison consisting of two Batallions. This journal was intended as a self-standing campaign narrative, thus spent more time setting up the relative strength of the town while truncating the details of the siege itself. As is often the case, this English account only bothered to mention the English-pay regiments participating in the siege. Its identification of the engineer Trognée by name is relatively rare among English accounts. 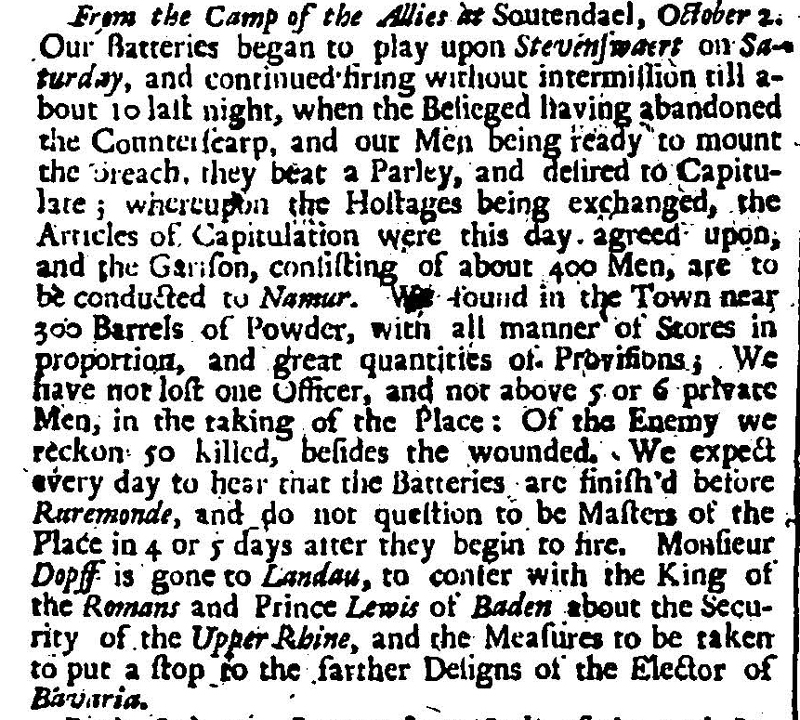 Another journal, An Exact Journal of the Actions of the Allies this Campaign in Flanders (published 1703) disposed of Stevensweert by merely mentioning that it withstood twelve days of siege. For contrast, our personal correspondence provides more insight into the opinions of our subjects than what is available in most official news accounts. Adam Cardonnel’s note to the under-secretary of state dated 2 October is one example, possibly even the cover letter under which our original newsletter was sent: “I am very glad to send you now the good news of the taking of Stevensweert which might have held out for a great deale longer if they had had a competent garrison.” Here we seem to have an interesting little tidbit about Cardonnel’s view of the competency of the garrison’s defense. But not so fast. 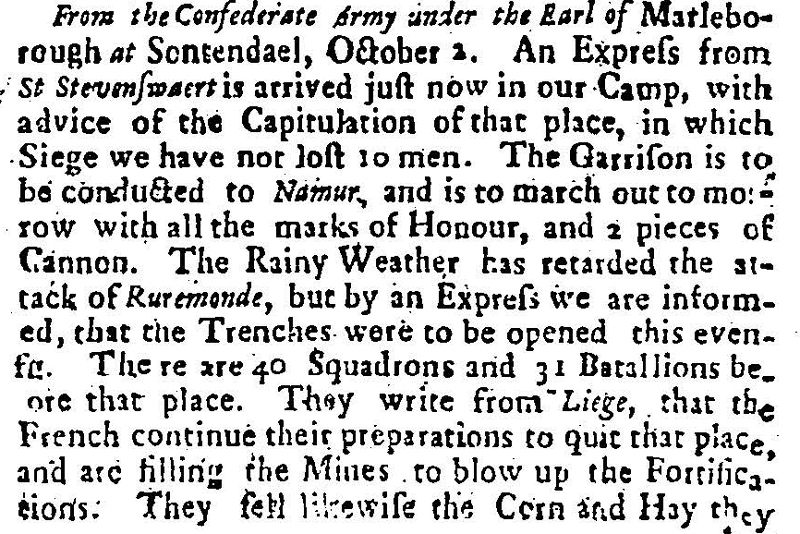 In a separate letter to Blathwayt (Secretary at War) on the same day Cardonnel clarifies what he likely meant by “competent garrison,” i.e. 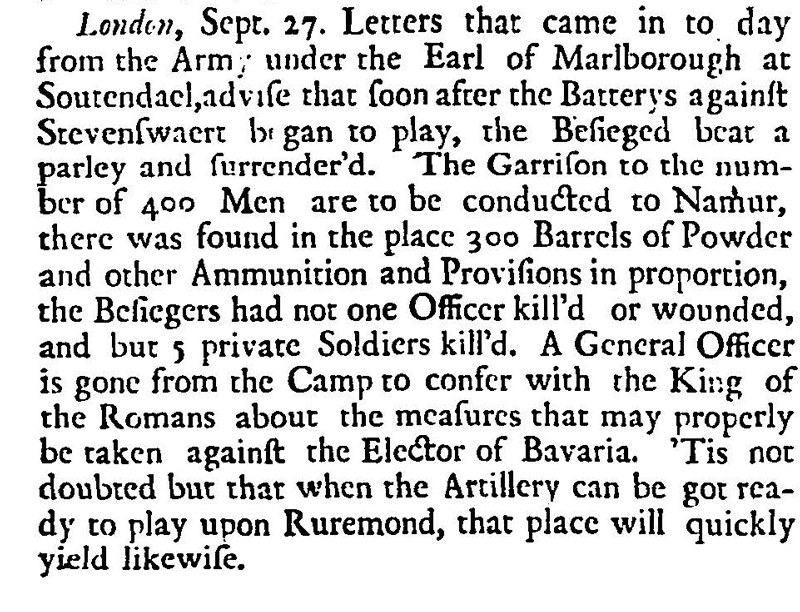 a “sufficient” one (an earlier letter also noted the small size of the garrison). Not quite an example of an early modern archaism, but another reminder nonetheless to look at several versions before reading too much into the specific language used in one account. Sometimes the letters sent out to different recipients on the same day are the same, but sometimes they have minor differences that might be of significance. We could continue on, doing what historians do: track down other accounts of the siege in the various archives, not only English but Dutch, French and Spanish. We would need to do so if we hoped to answer the broad questions that started this post. But what we can conclude from this random example is that the relationship between archival and contemporary published accounts is not as clear cut as one might expect at first glance. Archival documents, if sent to the right person, could be quickly published in order to quench the English public’s thirst for news, perhaps they were even drafted for a broad public audience. And their content might be further modified in the printing process. Broadening our scope, it appears that Englishmen and women who read widely encountered competing and overlapping views of the same event. Quite different sources would be needed to gauge the impact of these convergences and contradictions. I think some of the omissions might be simply because the siege was commanded by a Dutch general, Noyelles, and worse, in command of English troops. William had died in March and there was probably a widespread feeling of uncertainty about what would replace the strong Whig policy. Anne had not revealed her hand and Marlborough was considered a moderate Tory. Until he moved on to become “the War Leader” the values ascribed to military success, were better based on national considerations. Marlborough’s skill to be all things to all men was what enabled the WSS to develop as it did. Re: the reasons for the omissions. Most of the Low Countries sieges were conducted by non-English commanders (and rarely were even the approach commanders British) and yet some sieges were covered in much more detail than Stevensweert. So I’d think duration and intensity of the siege would explain the degree of coverage better – there just wasn’t as much to talk about regarding an 8-day siege, particularly for an English public that wasn’t keen on sieges in the first place. On the other hand, there was quite a bit of attention paid to Lord Cutt’s storming of Ft. St. Michael at Venlo that year because of vigorous English participation, even though the siege was short, and was commanded by Nassau-Saarbrücken and directed by Coehoorn. But it is something I’ll look at in more detail, i.e. the English domestic reactions to the campaigns and what they tell us. “As to Military Affairs, and Foreign Transactions relating to the Grand Confederacy, I have not wholly depended on printed Relations, which, for the most part, are very defective, and always extreme partial. Nor have I laid any Stress on publick Rejoicings on any remarkable Event of War; because they are generally no more than a political Flory, to amuse the Vulgar. …..